Here is another easy meal prep idea, this time for breakfast! I have been making these little egg muffins for a few weeks now. I bake them on Sunday and keep them in the fridge for quick breakfasts before work. They reheat easily in the microwave. I’m calling them egg muffins, but they are really like crust-less little quiches or even miniature omelettes. Here is one very important tip for this recipe: use a non-stick silicone muffin tray to bake these! They pop out so easily that way and you can avoid having to spend days scrubbing your regular muffin tin. The ingredient list is flexible so you can customize according to what veggies you love in your omelets or quiches. I love the combo of spinach, bell pepper, red onion, tomato, and cheese. Just add some slices of avocado and/or tomato or even a piece of toast to make it a meal. I always top my egg muffins with a couple dashes of hot sauce. Give this recipe a try if you are looking for a twist on your usual breakfast routine! 1. Preheat your oven to 350F. Lightly spray your muffin tin with cooking spray. Make sure to use a nonstick silicon muffin tray, if possible! Put the muffin tin on a cookie sheet for stability. 2. Whisk the eggs in a large bowl and add the salt + pepper. 3. Mix in the veggies and cheese. 4. Using a small ladle, fill the muffin tins. You’ll have enough for 12 muffins. Bake for 20-25 minutes, until the muffins are set to your liking. They will puff up as they cook and then deflate a little as they cool. Enjoy! Here is a great make-ahead salad idea perfect for weekday lunches. I take lunch with me almost every day during the work week and I am always looking for inspiration in that area. Heating up last night’s dinner can get old. I love bringing this salad because I know I have something fresh, crunchy, and delicious to eat when it’s time for lunch. When I have the time, I make the special lemon-oregano dressing as described. It’s bright and tangy. I sometimes bring it in a small container and pour it on the salad right before eating (this feels very fancy). I also sometimes dress the salad ahead of time and that works just fine too. When I’m short on time, I use a little bit of bottled salad dressing and garnish with some fresh chopped oregano to get that delicious Greek salad flavor. The amounts listed here will make enough salad and dressing for four lunches. Note: I listed 2 cans of chickpeas for four salads because I like a lot of chickpeas in this to fill me up. The original recipe calls for only 1 can of chickpeas for four salads. You choose what is best for you! 1. Mix all the dressing ingredients in a small bowl with a whisk, or shake everything up in a small jar with a tight lid. Divide up the dressing into four small containers. 2. Assemble the salads, dividing up the components among four lunch containers. Arrange the different components in a way that looks beautiful and delicious to you. If you have it, sprinkle a little Za’atar seasoning on each salad to add a little extra flavor. Store the salads and dressing portions in the fridge until you need them! Aaaaaand we’re back! Apologies for the unintended hiatus. Here’s one more soup idea for 2014. It’s easy to make, delicious, and a little spicy! All the credit for this soup goes to The Sprouted Kitchen. I’ve written out the recipe below, but I didn’t really change much from the original, other than subbing carrots for the sweet potato because it’s what I had on hand. I’m sure the sweet potato option would be equally delicious. Either way, this recipe is a keeper. Happy holidays to all the spirited Soup and Such readers out there! I hope you get to clink glasses with people you love as you ring in the new year. I have promised myself to keep this blog freshly updated throughout 2015. Can’t wait to share more easy vegetarian soup et al. recipes with you! 1. Melt butter in your favorite soup pot. Add the onion, garlic, salt, and pepper. Cook for about 5 minutes. Add the ginger, turmeric, cumin, curry, cayenne, split peas, and broth. Mix everything up, bring to a boil, then simmer (covered) for about 45-55 minutes (or until the peas are very soft). 2. Use an immersion blender to puree the soup to desired thickness. Then, stir in the coconut milk and orange juice. Warm the soup back up and give it a taste for a seasoning check. Mine didn’t need anything at this point – it was good to go! 3. Serve in bowls with chopped cilantro as a garnish plus an extra drizzle of coconut milk, if desired. 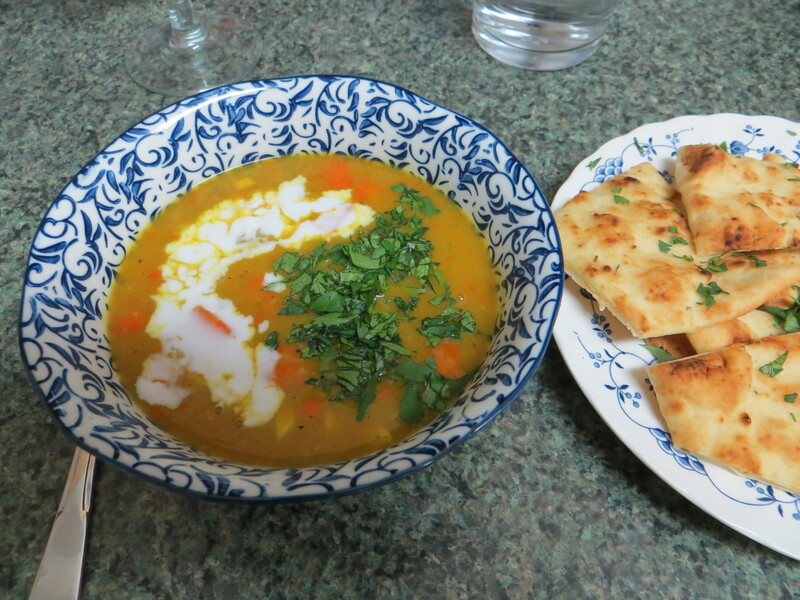 This soup goes really well with Naan on the side! Categories: Uncategorized | Tags: vegetarian soup, yellow split peas | Permalink. Meet my new favorite salad. I made it for the first time a few weeks ago, and I’ve made it about three times since then. It’s delicious and very easy to throw together. The only thing you have to cook is the quinoa; everything else just gets chopped and thrown into the bowl. Mix up a super simple honey-dijon dressing and that’s it! Lunch is ready. This is one of my new favorite ways to eat kale, too. 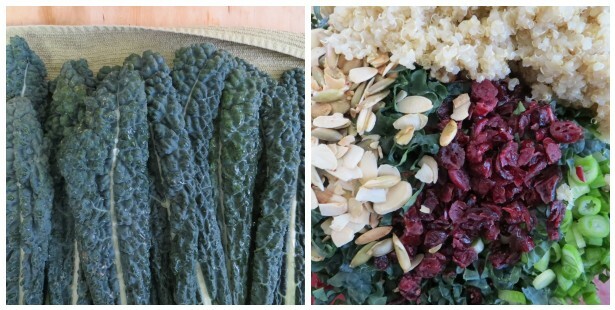 I’ve tried a few raw kale salad recipes before, but this is by far my favorite. For this salad, make sure to use flat-leaf kale (not the curly kind). One of my grocery stores calls it lacinato kale, and the other calls it dinosaur kale. The name dinosaur kale is appropriate because its leaves are bumpy, like what I imagine petting a dinosaur would feel like. I find that it’s a great variety of kale to eat raw in a salad because the leaves seem more tender and don’t require any massaging to break down. I never have any trouble finding it in my various grocery stores, so keep an eye out for it! I hope you give this salad a try. It’s so good! This salad makes a super satisfying lunch, especially on a work day. The nuts and berries can be easily substituted with whatever variety you have on hand. I used feta, but the original recipe calls for ricotta salata. The lemon zest really adds some flavor, so be sure to include it. 1. 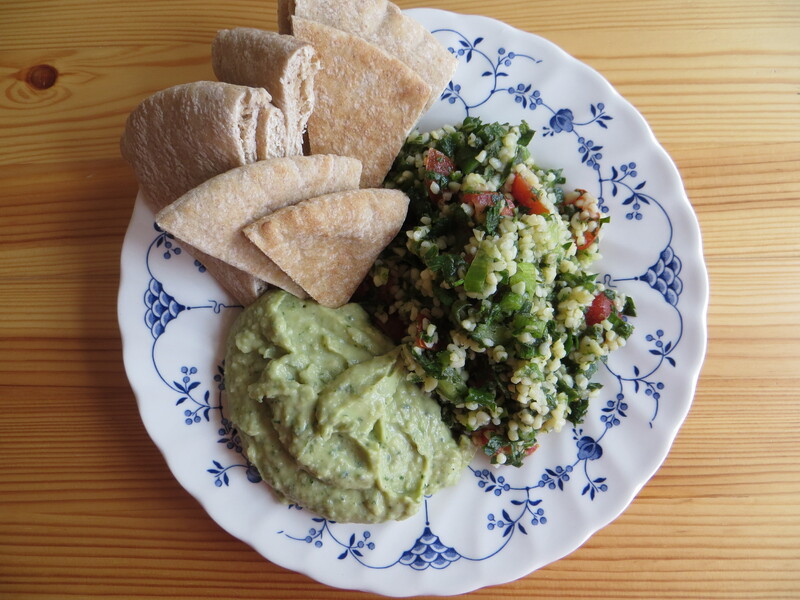 To make the quinoa, combine the rinsed quinoa with 1.5 cups water in a medium saucepan. Add a few pinches of salt. Bring to a boil, then lower the heat and simmer (covered) for about 15 minutes, or until the water has been absorbed and the quinoa is tender. Set aside to cool, then fluff with a fork. 2. Rinse and dry the kale leaves. Remove the tough stems and ribs from the leaves. You should end up with long, thin leaves. To slice them, stack a few of the leaves into a small pile. Then, roll up the stacked leaves (the long way) as tightly as you can. Using a sharp knife, very thinly slice the rolled-up stack of leaves. You should end up with thin ribbons of kale that resemble the fake green grass people put in Easter baskets. 3. 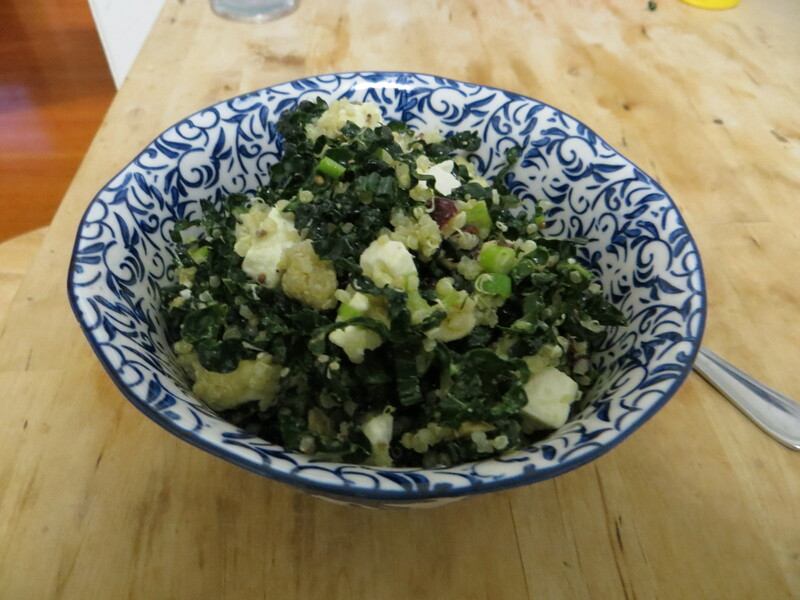 Combine the kale ribbons and cooked quinoa in a large salad bowl. 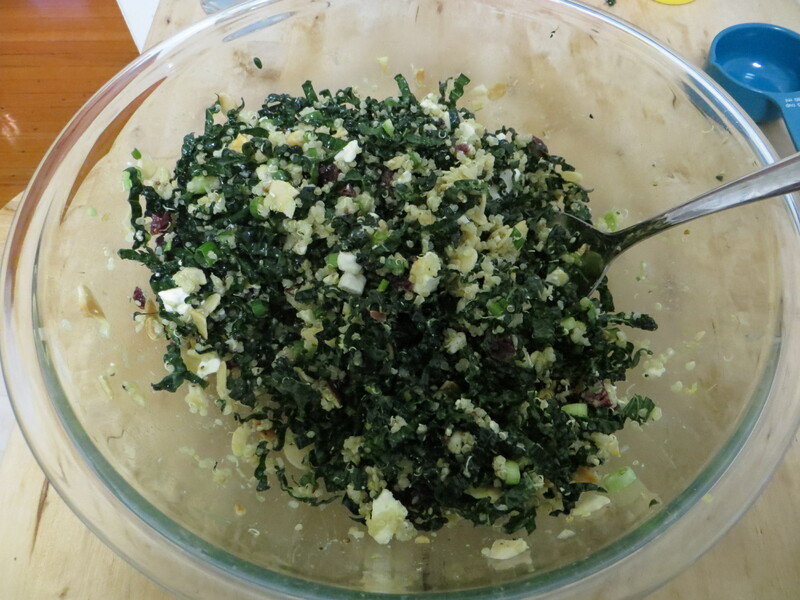 Add the remaining salad ingredients (almonds, cranberries, scallions, lemon zest, and feta).Toss to combine. 4. To make the dressing, whisk together all the ingredients in a small bowl. Alternatively, you could add all the ingredients in a small jar with a lid and shake to combine. Pour the dressing on the salad and toss to combine. I find that tongs work best for this job. 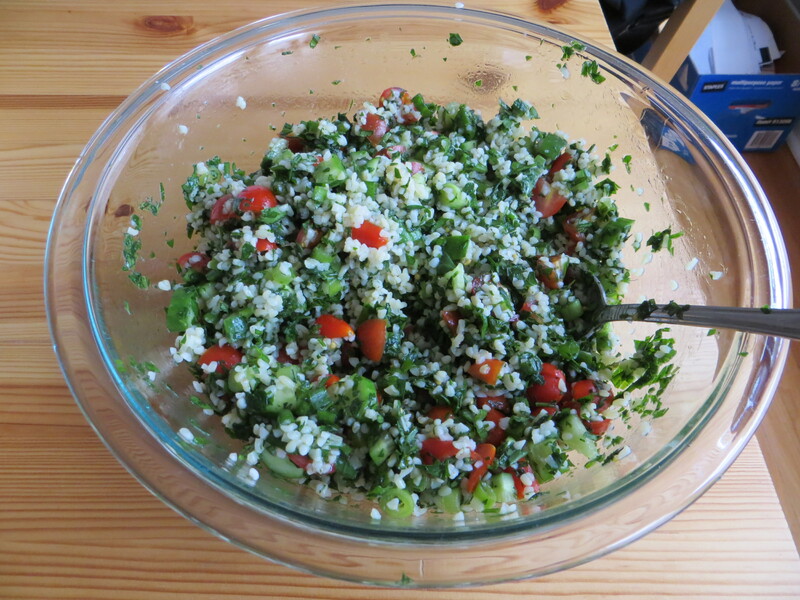 Categories: easy, feta, kale, quinoa, salad, Uncategorized, vegetarian | Tags: feta, kale, quinoa, salad, vegetarian | Permalink. Red lentils are a favorite legume around here. They are inexpensive, easy to cook, very tasty, and a good source of vegetarian protein. We just love ‘em. 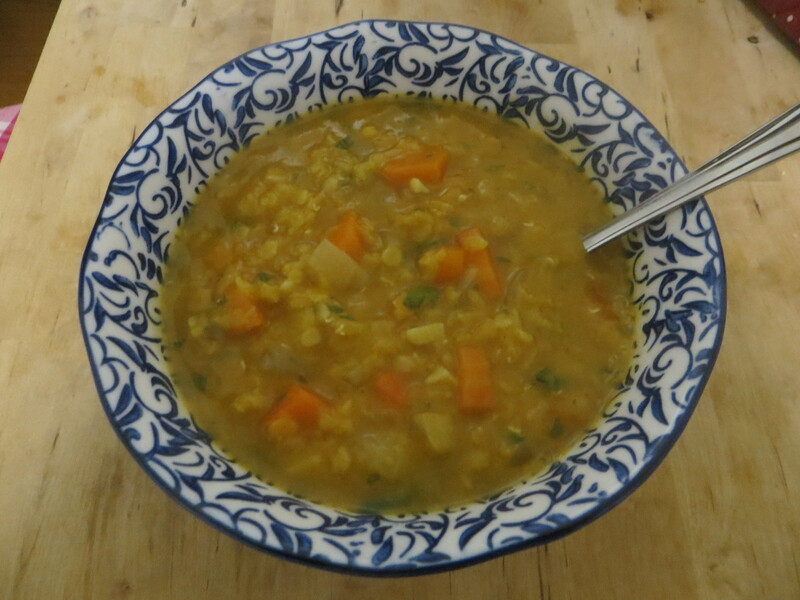 Here is a delicious red lentil soup that is really easy to make. There is very little chopping/prep work involved, which has been a top priority during this busy winter season. The flavor of the soup is wonderful; the cilantro and lemon add a nice brightness to the lentils, so don’t leave them out! The amounts here make a big pot of soup. If you’re cooking for just a few, you’ll have plenty of leftovers to freeze for quick work lunches or weeknight meals later on. 1. Heat oil in your favorite soup pot, then add onions and garlic. Cook for about 5 minutes. Stir in tomato paste, cumin, salt, pepper, and cayenne. Stir everything around and cook for about 2 minutes. Add the stock, lentils, carrots, and 2 cups water. 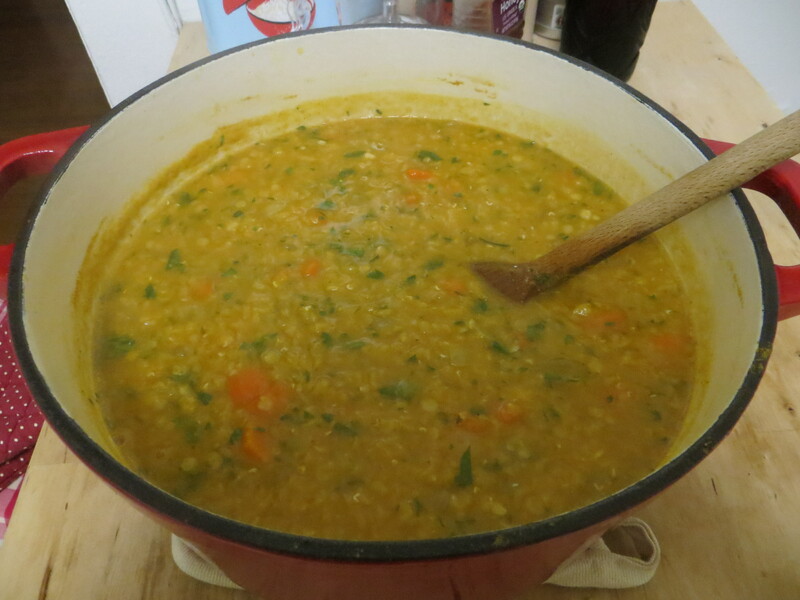 Bring to a simmer, and then partially cover the pot and cook for about 30 minutes (until the lentils are soft). 2. Remove the soup from the heat, and use an immersion blender to puree about half of the soup. You can puree the entire soup if you want, but I like to keep a little texture. Warm the soup back up and stir in the cilantro and lemon juice. Taste the soup at this point to see if you need more salt, lemon juice, or pepper. Adjust to your own taste preferences! Enjoy! Categories: easy, lemons, red lentils, soups, Uncategorized, vegan, vegetarian | Tags: easy red lentil soup, lemon, vegan, vegetarian | Permalink.